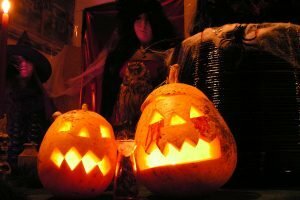 Halloween in 2019 is 25th-27th Oct and 31st Oct-2nd Nov. NB! Details are TBD for 2019. Muncaster Monster Cabaret with continuous entertainment right through – conjuring and comedy, aerialist’s shows, fire-eating and more, featuring Astral Circus, The Fire Man Dave and shows from one of the current Fool of Muncaster Frumpid Stumplestone, Darren De Lusion or ex-Fool Dizzy O’Dare. The Scary Maze (not recommended for under 12s particularly in the evenings) – the Meadowvole Maze is transformed into a dark and scary otherworld for Halloween. Definitely not for the nervous! Boo! ‘Spookulele Stories‘ where you the audience use ukuleles to create the creepy sound effects to some of Muncaster’s own ghost stories. 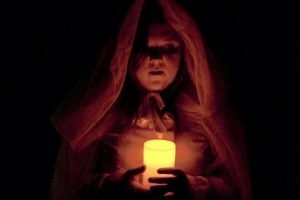 Scary storytelling daily event in the churchyard, will move to the Ghostly Grotto if wet. ‘Arroween’ archery* with Independent Adventure, on the Castle lawns on Friday, Saturday and Sunday only. …all available to holders of Halloween General Entry Tickets plus the Gardens, Enchanted Trail, Hawk & Owl Centre and 2pm Sky Hunters bird of prey display all thrown in. Holders of general entry tickets including the daytime Castle visit should be aware the Castle will close earlier during Halloween. 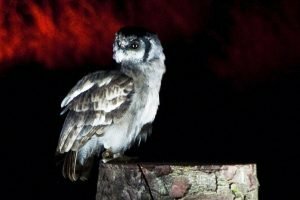 See the Hawk & Owl Centre’s fantastic Twilight Owls display when our falconers fly a selection of our beautiful owls in the gardens after dark in low-level lighting and with atmospheric music. Starting promptly at 7pm, the display lasts approximately 30 minutes (separate top-up tickets required as places are limited. Tickets available online in advance until 11am on the day and onsite ONLY after that time). 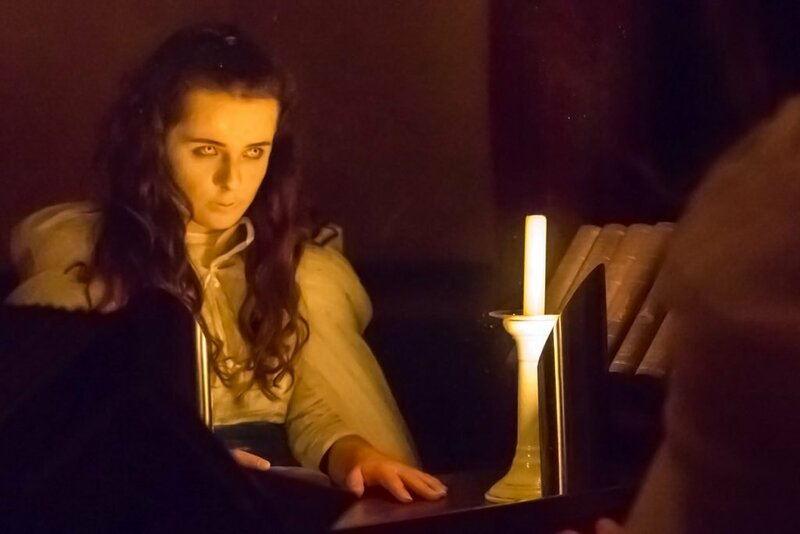 A theatrical event in the Castle and scripted afresh with a new theme each year. In association with the University of Cumbria Performing Arts department, the tour will run at set times through the evenings and sell out every year so book early to have your choice of date and time. This activity is suitable for children but with its Halloween theme in the Castle after dark, inevitably more nervous youngsters may find the tour frightening. While as an activity the Castle Halloween Tour is not aimed at infants, we offer limited places free of charge for under-5s to accompany their families. Please note that your Castle Halloween Tour ticket is a ‘super ticket’ for the tour at a fixed time plus general entry with the daytime Castle visit included too. 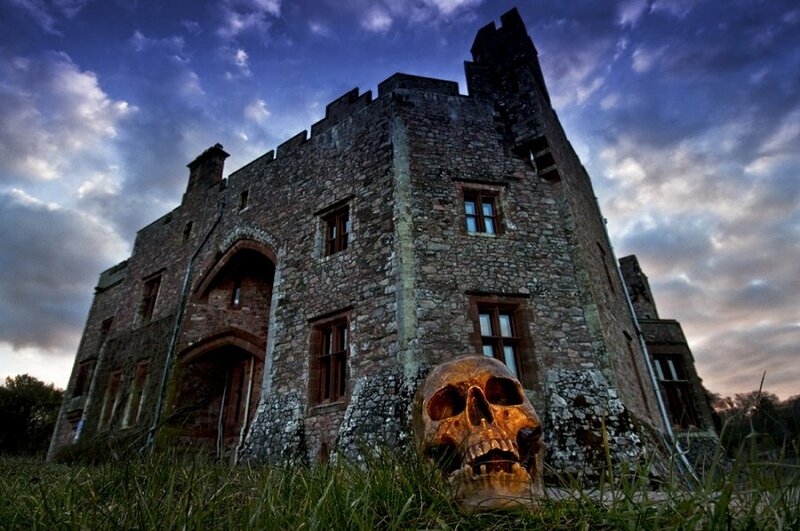 The making of the 2016 Castle Halloween Tour featured on Channel 4’s series The Yorkshire Dales and The Lakes, screened on More4 in July 2017. The cafe will stay open later for food and drink, plus on the peak nights we are joined by some of our favourite outside caterers. Looking for accommodation over this period? Stay onsite at the Coachmans Quarters B&B with Halloween general entry free of charge. Book with us direct for this period on 01229 717614 or email us at info[at]muncaster.co.uk. Alternatively, stay at the Pennington Hotel in Ravenglass who can offer discounted Halloween general entry tickets to residents. Please note that all under-16s must be accompanied by an adult at all times. 15% discount for online purchase of General Entry and Castle Halloween Tour tickets. Please note that box office sales over the telephone will be at the full price or incur an administration charge, at our discretion. Group rates for general entry and Castle Tour tickets are available for prebooked groups of 12 or more – contact us to book. Daytime Hawk & Owl Centre visit incl daytime bird display, Gardens, Scary Maze, Monster Cabaret and Ghostly Grotto. NOT included; Castle Tour OR Twilight Owls display. 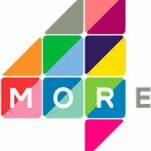 Ticket prices – Adult – £13.00, Child – £6.50, Under 5s Free (no ticket required). With daytime Castle visit – Adult – £16.00, Child – £8.00, Under 5s Free (no ticket required). NB Castle open 12-3.30pm for daytime visits in Halloween Week. Open-dated ticket valid for any one day of Halloween Week. Buy online and save 15%! Fixed date ticket for an evening Castle Halloween Tour, which is a theatrical event at pre-booked time. Customers wishing also to see the Twilight Owls should avoid booking Castle Halloween Tours at 6.20, 6.40, 7.00 and 7.20. Tickets cover daytime Castle visit (12-3.30pm), daytime Hawk & Owl Centre visit incl daytime bird display, Gardens, Scary Maze, Monster Cabaret and Ghostly Grotto PLUS your Castle Halloween Tour. The Twilight Owls are NOT included and ticketed separately. Ticket prices: Adult – £24.50, Child – £12.25; tickets are required for under 5s but are free. Tour tickets on sale online until 3pm on the day. Any remaining tickets are also available to purchase onsite on the day as upgrades to general entry. Tour tickets are non-refundable except at our discretion and may not be exchanged on the day of the tour. Buy online and save 15%! Entry to the display, running nightly at 7pm. 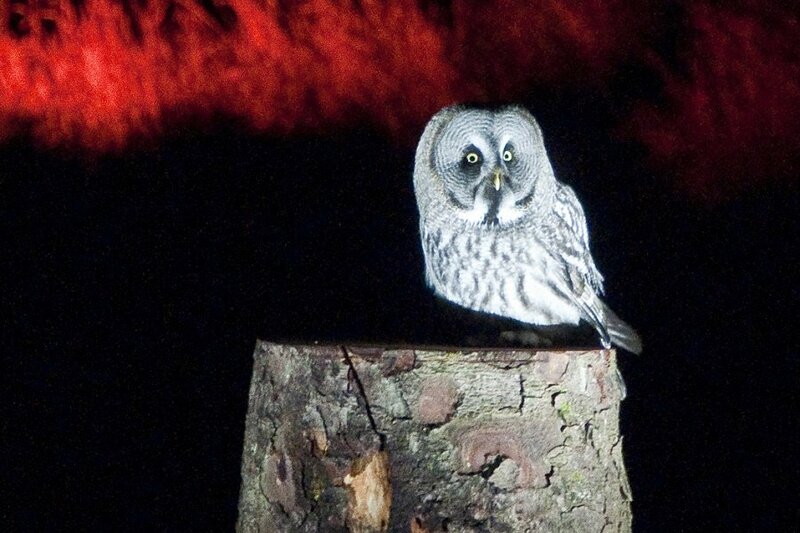 Twilight Owls customers should avoid booking Castle Tours at 6.20, 6.40, 7.00 and 7.20. Ticket not valid for entry to Muncaster on its own; you will need an entry ticket as well (Halloween General Entry ticket OR a Castle Halloween Tour ticket OR be a Friend of Muncaster OR a Coachmans Quarters B&B resident). Ticket price £3.50 per adult or child aged 5-15; tickets are required for under 5s but are free. Valid for the display on the date selected only. Buy online before 2pm on the day or unsold tickets can be purchased onsite on the day. Friends of Muncaster? – free general entry all week! You will need tickets for the Twilight Owls. You will also need to purchase tickets for the Castle Tours – enter your membership reference in the promotional code field for 50% off the full price. Book your tickets for timed shows early!